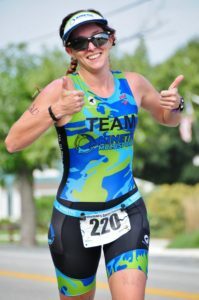 My name is Audessa Vaught and I started racing triathlons in 2013 with my mom. My first race was the Ramblin Rose Super Sprint in NC and from there I have worked my way up to the 70.3 distance. This season (2019) I will be tackling my first Ironman and competing in Long course Aquabike at Worlds. I was a swimmer growing up and have coached swimming for the last 12 years so my heart lies in the open water. My parents met cycling so biking has always been a staple in my life and even led to a brother/sister bonding trip to cycle across Spain a few years ago. I’ve had 2 ankle surgeries and basically didn’t learn to run until 2013, but I am gradually learning to appreciate the pounding of my feet on the pavement. Triathlon has helped me to lose 40 lbs and gain a new appreciation for life along with an amazing new group of friends! When I’m not racing I am a social worker currently living in Laurel, MD with my 3 cats.